"The Learning Trail was like a second home for my son, every single day he was there, the team showed genuine care and affection to him. The teachers were always attentive and used teaching methods and activities that always combined learning with play. Haidar felt secure, happy and confident and his motor skills improved tremendously. In the Learning Trail, children learn so much about their culture and the environment in the most fun and engaging ways. They also focus on the importance of good manners and the use of the Arabic language. I always felt that Haidar was in a safe environment that encouraged creativity and provided him with skills he needed for the next stage. It was a wonderful experience for both Haidar and myself". HRH Princess Sima Abbas (mother of Prince Haidar Bin Abbas). "A happy place! This is the first thing that comes to my mind when I think of Learning Trail Nursery. Eleven years ago my eldest started his first school experience at Learning Trail and two years ago my youngest joined this lovely nursery. Through organized play and circle time among other activities, children learn basics such as the alphabet in Arabic and English, colors, numbers and simple mathematics but they also take home with them good manners, good Arabic, great social skills and something you can’t quite put your finger on that distinguishes Learning Trail children from other day care children. Thank you for the amazing work you do, keep it up please". "Learning Trail was a warm and loving second home for my son for two years. I was impressed with how fast my little one learned, grew and developed in the hands-on, play and exploration based educational environment at Learning Trail. Montessori’s methods of teaching also had great impact on my son's skills. I was delighted with how my child was truly loved and nurtured by the staff and teachers. Learning Trail encouraged my son's curiosity and individuality, as well as his love to learn, play and explore in his own unique way! We miss Learning Trail everyday!" "Learning Trail Nursery is a place that feels like home. A loving safe environment where a child can learn, grow, and have fun. It has a beautiful garden and a playground where children enjoy playing outdoors and feeding some farm animals. The teachers are very kind and experienced . The Montessori exercises, the Arabic and English (art, music, cooking, PE) they offer, is an ideal way for a child to develop mentally, emotionally and socially. My son looks forward to going to class everyday and seeing his friends and teachers. As a parent, I am very happy to have such a great early learning experience for my child." "Such a loving, caring, “feels like home” nursery! 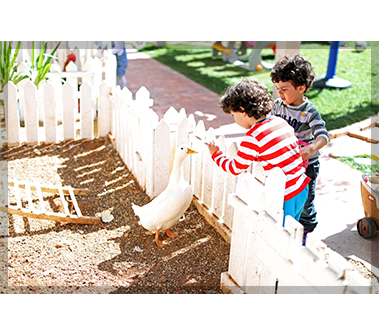 I love how our kids can still feel the innocence and simpleness of how a nursery should feel… love how kids can feed the chickens, rabbits and ducks! plant organic mint, thyme and lavender. Thanks to you, Jad wants to go to school every day even on holidays, will you open Fridays and Saturdays??" "We love Learning Trail! The teachers and staff are loving friendly and easy to communicate with. Their outdoor play area is big , the toys are always updated and there are always animals to feed and care for. So sad to be leaving!" "I used to be there when I was little..now I am in 7th grade but I wish I was 3 years old again. I used to be in the Rabbits class and Ms. Deema used to teach me. I even remember the field trip to Cozmo! We even had a movie class! I love you and thank you so much for making me great! Say hi to Ms. Mervat." "It's like walking into a sanctuary every morning. We are welcomed by Ammo Farid’s friendly smile, walking past the vibrant and inspiring playground, Miss Mervat with her inviting smile and cheerful good morning that not only warms Hussein’s heart and mine but also reminds me of the beautiful day to come, Miss Aline who gets out her chair every morning to greet Hussein with a hug full of love and pure joy. Teta Noor and her serene smile and kind eyes, the genuine and warm teachers not only Hussein’s class teachers but every single one of them, who open their arms and hearts to us daily. The beautiful work they do to establish deep and firm roots and a humbling connection to nature, our heritage and humanity. From sharing their breakfast with the animals in the playground, to watering and looking after the plants in the schools garden, to the carefully and creatively designed activities and themes, every single detail of my child’s day is thought of with great attention to detail and with dedication. I’m positive Hussein will leave Learning Trail with his heat full of love and gratitude, his feet firmly grounded and a light spirit as I do every day."